The last seventeen hours of the eighty-five hour trek were spent on the overnight train from Johannesburg to Queenstown. Even in our weary state the new impressions and damn cold July night kept us awake well into the journey. The private berth and fine linens remain a vivid memory. The inoperable heating unit remains a puzzle. The real china and porter service enjoyed in 1988 have long ago left the rails of South African public trains! One other image was etched in my memory that night nearly twenty four years ago. As we passed through empty Free State stations and changed locomotives in Bloemfontein and through a couple of sidings in the Eastern Cape the glare of stainless steel and polished brass kept appearing. Straining through watery eyes into the dull lighting of those stations I could not identify what the railway workers were carrying! The backs of three men dressed in dark blue provided huge contrast to the little metal boxes in stainless and brass! There were dull galvanized models and a rare stainless and copper top but the indelible image is the "Out of Africa" look of shiny stainless and polished English brass. Before I even knew what that metal box was, before I even reached our final destination in Africa, I knew I had to have myself a railway tool box. The problem arose after settling in Queenstown that no matter who I asked they did not have a clue what I was talking about. Where can I find a railway worker's metal tool box? That question seemed to be more urgent to me than finding a home for my wife and three small children. Yet no matter whom I asked no one had a clue about the fancy railway workers' metal tool boxes. Then I lucked up and met a retired railway engineer who pushed beyond his total bafflement about my question and quizzed me in detail about the object of my search. Voila! The problem with the workers' metal tool box is that it did not exist. Those shiny stainless and polished brass boxes were SKOF TINS!!! So how the hell was a cracker from South Carolina on his first railway passage into Africa to know such a thing as a SKOF TIN existed. The lovely and timeless boxes were used by the railway workers to carry their daily bread and work related documents and ID books! The Skof Tins had nothing to do with tools. Fine! At last I and everyone else knew what I was looking for. That made the search simple. Within days I met Mr. Gert van Staden in Queenstown who happened to hand manufacture these amazing tins in a 2m X 3m laundry room at the back of his garage. Oom Gert was long retired and busier keeping the grounds of the local Dutch Reformed Church than he was at manufacturing Skof Tins. Yet after some begging, groveling, and threatening a few American tears Uncle Gert agreed to make my first stainless and brass Skof Tin. The Holy Grail of South African Railways and the most unforgettable image of the last leg of our long trek was soon in my possession. That first Skof Tin is still a treasured relic after my 24 years in Africa. If I were an Egyptian Pharoah or a Cherokee Chief that first Skof Tin would go with me when I trek off to the Happy Hunting Grounds. Knowing what a prize it is that Skof Tin will be a valuable relic in my estate! Oom Gert did not make too many more Skof Tins in his life as he battled getting materials and then with motivation as he aged. There are only 2 of his Skof Tins in my possession today. They occupy specific places in the home and receive due polishing whenever the sparkle subsides. I always said "no man deserves a Skof Tin if he refuses to polish it!" That's still a rule and it applies to THE TRAVELING WRITER writing instruments offered from this website. 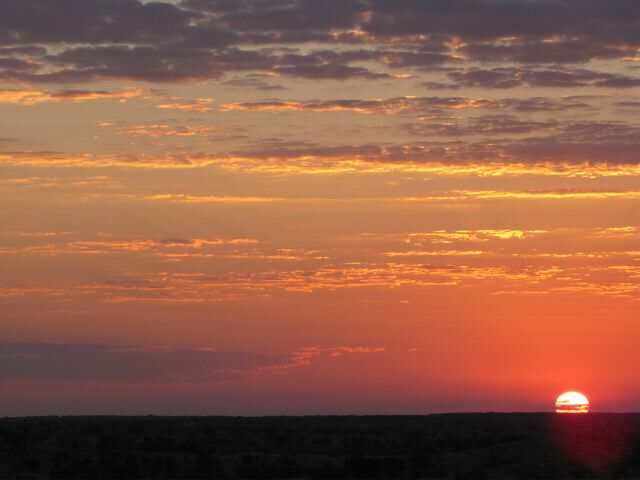 Traveling Writer Kalahari Sunset....."something to write home about!" The TRAVELING WRITER is a pen I designed to reflect the appearance and the spirit of the first stainless and brass Skof Tins seen from the railway coach that cold June night and July morning in 1988. I invite you to compare the images of my Skof Tin and of my first TRAVELING WRITER. Those relics are about the Road, about the Pilgrimage, about the Journey, about the Risk, about the Dream, about the Adventure, and about the spark ignited in the human heart, mind, and spirit by new impressions and "the Road." The thought of the TRAVELING WRITER came to me while on the Road in England after purchasing a pen to serve as the relic for the 2011 sojourn in Dorset and Aberdeenshire, Scotland. If you are one that receives revelations and "good stuff" while on the Road you will understand how this pen was born. On the cap of the Traveling Writer there is one of my favorite quotations engraved, some weaving of words of my own: "Rather The Road Than The Castle!" r.vehorn. That sums up the spirit and longing of any Traveling Writer. The van Staden Skof Tin in shiny stainless and polished brass is no longer available anywhere in the world. But the TRAVELING WRITER fine writing instrument remains a rare but available find in 2012. If you are one of us "who have something to write home about" and if you are one of us who support "the right to bear pens" then let's talk!